Holiday travel time is just around the corner, it’s time to get prepared. Everyone knows just how hectic airports can be around the holidays. And everyone also knows just how annoying the hour-long security lines can be. The worst is when someone holds up the line because their liquid products don’t satisfy requirements. Embarrassing! And annoying too! There is nothing worse than having to dig through your carry on and throw away your favorite products. Unfortunately, there is no getting around the security lines—but you can expedite the process by being prepared. 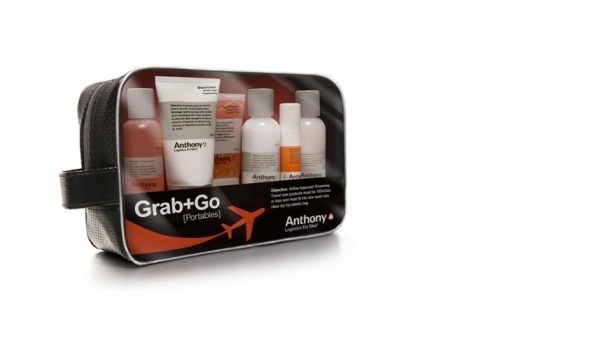 Anthony Logistics for Men has just what you need to practice safe travel during the most wonderful (and busy) time of the year. The Facial Cleanser is the ultimate face wash, buffing away surface skin cells with key ingredient, Glycolic Acid. Chamomile is added to naturally calm skin, and Grapefruit Oil, essential to your skin’s revival. It’s the perfect way to refresh your face on the go. Lips are prone to cracking, especially in the cold of winter. Keep your lips smooth and protected from harsh winds with a natural Beeswax lip balm containing essential ingredients such as Calendula and Aloe that soothe and hydrate. So your flight is arriving and you have no time to stop at the hotel to freshen up and shave before the big family dinner. Good thing your Grab+Go kit has a shave cream! Anthony’s Shave Cream has Eucalyptus Oil to soothe and plenty of vitamins to ensure the closest shave. Perfect for shaving in a compact area like the airplane bathroom! Those great products, along with the others featured in the Grab and Go Kit, will keep you from embarrassing travels this year. Where ever you go, with Anthony’s kit, you know you’ll be prepared for hectic holiday travel. Each item in the kit is under 3.0 fl oz. The best part is, all of these compact items can be used on the go and tucks easily into your carry-on!